It’s fair to say that 2017-18 was a mixed season for Ross County. Coming on the back of our 2nd top six finish and the amazing achievement of lifting the League Cup, from the start there wasn’t much chance that we’d manage to top last season. But while there were lots of reasons to be concerned through the season, in the end we finished strongly and took 7th place – which I’d certainly have taken at the start of the season. It all started so badly, back before the season even began. Our League Cup defence was, without sugar-coating it, a disaster. A home draw, and defeat on penalties to Raith Rovers, followed by an away defeat to Alloa put paid to the hopes of a run in the competition and saw us knocked out before we hit our first game in the season. Not stuff a good season is made of. But in a bit of a twist, we actually started the season quite well. We’re not normally known for getting points on the board early, but at the start of September we were in the heady heights of fourth place. Our mid-season form, apart from a brief spell in January, was weak though – as we shipped goals needlessly and lost games because of it. Despite having good personnel, we’ve struggled to find defensive combinations that work – and all too often their decision making at crucial moments have let the side down. This has been a problem with County for years now, and it’s important that we see it fixed next season if we’re to realise our potential. Our unbeaten run at the end of the season, including that draw against Celtic, probably put a gloss on what was a little sub-par from what we’ve expected. Finishing 7th is brilliant for Ross County, and the fact that we were level with Hearts and ahead of Partick Thistle on points shows that we could be a top six side if we put our best foot forward next year. When we play with attacking flair, and string passes together – we genuinely threaten anyone in the league. We managed good results against some of the top teams, going unbeaten against Rangers, getting lots of points off Hearts’ and putting good performances in against Celtic. More of the same would be good, just as long as we balance it at the back. My player of the season is an easy pick this year, with Liam Boyce going the extra mile and pulling off the phenomenal achievement of being the Premiership’s top scorer. His 23 goals beat off competition from Scott Sinclair and Moussa Dembele, both valued in the millions of pounds and while playing at a rampant Celtic, so being able to conjure that many goals at Ross County is surely an incredible feat. Without him scoring 48% of our league goals I’ve no idea where we’d be in the table, so it’s got to be him that’s made the biggest impact on our season. Scott Fox has been sensational at the other end too, and proven why he’s one of the best keepers in the league, but Boycey’s return this season makes it no contest. The highlights of the season were our wins over our rivals over the bridge, beating Caley three times and drawing the other. Considering how they’ve had the upper hand on us for countless years, going into derbies and getting results is a fantastic feeling – and apart from our famed cup runs there can’t be many better results we’ve had than beating them 4-0 at home back in April. Another undoubted highlight was the incredible performance of our Development Squad, who won their league ahead of the biggest clubs in Scotland and with a tremendous grit and determination towards the end of the season. It’s amazing to think our youth team is the best in the country, and it’s all down to the effort of some fantastic coaches, phenomenal young talents, and the ideal manager in club legend Stuart Kettlewell. I’d be surprised if we could ever repeat the feat ever again, but knowing that the club can produce players of real quality – and perhaps a manager too – bodes extremely well for us in the future. The derbies will be a miss next season, with Caley slipping into the Championship, but hopefully they’ll come back up soon. The Highland derbies are a great spectacle for the fans and an important sign to the rest of the country that football is alive and well here. So where to for next season? For me, staying up is again the priority, as even though we have the team for it – we need to make sure that we recognise the bottom line for our club is to remain at the highest level. With a good start, and better consistency, we can definitely push for top six – but if we take 7th spot next year I’d be happy. I’d also really like to see us on a cup run as well, as there’s something magical about the one-off ties that mean so much that league games don’t quite match. Reaching Hampden again might be a little ambitious, but if we can get to the quarter-finals of either trophy I think that’d be a good showing. Our crop of players is strong at the moment, and it’s great that such key figures as Fox, Davies and Schalk have all put pen to paper on deals keeping them at the club for a year or two more. Kenny van Der Weg and Jim O’ Brien are two players whose contracts run out this summer, and hopefully both can be snapped up too as they’ve made strong contributions to the side since arriving in Dingwall. The “big one” that all fans would love to see is Liam Boyce signing on for a longer spell, as he’s currently contracted to 2018, but I’d be amazed (although obviously delighted) if he stuck with us until then. His goals have been beyond important for our club, and he’s played with a skill and a class that’s been unmatched at the club. 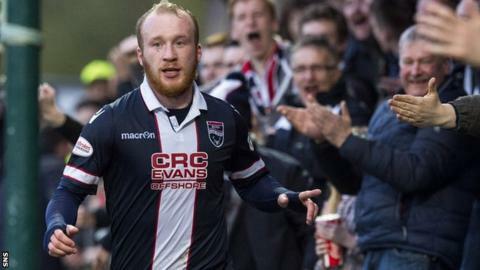 He’s been an incredible servant to Ross County and no matter what he decides to do he’ll always be remembered fondly at Victoria Park. All-in-all I’m optimistic that County can go on to bigger and better things next season, as long as we prepare in the right way and do our best to make a stronger start. It’s never an easy season following the Staggies, but there’s no doubt that it’s always an adventure to be savoured. I can’t wait ‘til the season starts back up again in late July.